We are a London based, specialist vintage-style covers band. We play covers of the best and most well-known songs from several different genres including, rock, pop, jazz, country, disco and RnB, performing them in our own pre-1950s 'vintage/retro' style. Check out the info below for an idea of what we will do at your event. Vintage dancers, who will do a short taster lesson to teach you vintage dance moves! The dancers then stay and get your dancefloor going, and can perform routines to our live music. We’ll normally arrive to set up at 6pm, which will include a short soundcheck. Setting up takes about an hour, but it’s best to assume it’ll take 90 minutes in case access to the venue space is difficult etc. After set up we’ll go to the band room to get changed and prepare for the performance. This is the best time to provide food and soft drinks for the band. 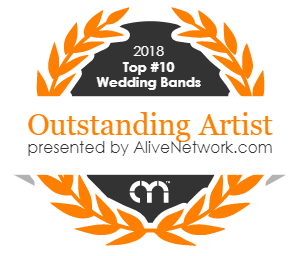 We’ll start the first 45 minute set with your first dance if it is in our repertoire – or we’ll play the recording on our PA system if it is not. We’ll then perform a great mix of vintage covers of rock and pop songs. After a short break, we’ll perform another 45 minute set of vintage covers. The quotes are based on us finishing our performance by midnight. If you have any other questions or would like to discuss things with us in greater detail, please feel free to get in touch with Graham our agent at Alive Network on 0845 094 3816, who will be more than happy to discuss your requirements.